Alright ladies and gentleman, it is the start of November, which usually means that half the population of men choose to grow out their facial hair, also known as No-Shave November. No-Shave November is a month-long journey in which participants forgo shaving and grooming in order to evoke conversation and raise cancer awareness. From my experience with my fiancé and his friends, it’s not just the growth of a little past the stubble stage – they go all out. 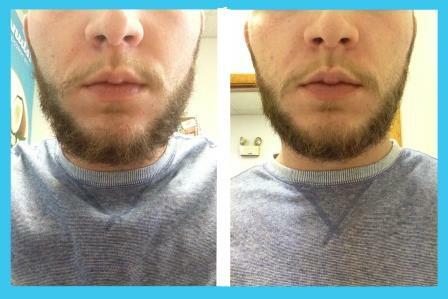 Beards and facial hair in general can go through awkward stages when growing, sometimes looking messy and even fuzzy. To help the transition of growing your beard in a clean and smooth manner, coconut oil should be your go-to ingredient! Yes, coconut oil is normally used for cooking and baking, but this healthy fat is also amazing for adding moisture to any part of your body. Here are two tips on how to use coconut oil for growing out your beard and also for shaving, when that time comes. Growing Out Your Beard – Start by taking a generous amount of coconut oil and massage all around your facial hair. You may experience dripping, so have a towel or paper towel nearby to dab off any excess oil. Keep the coconut oil on your beard or growing facial hair for approximately 15-20 minutes. Next, shampoo and condition in order to make sure the coconut oil is completely gone. After doing so, your beard should have a more relaxed appearance and softness. You can do this DIY treatment as often as you would like, however our male tester did this every two to three days. As an added tip, the longer you leave the treatment in, the better the effects may be! Shaving Your Beard – Whether you’re tired of having facial hair or you’re planning on shaving your beard off in December, using coconut oil as a shaving cream will be extremely beneficial. Start by applying coconut oil to your beard or surrounding facial hair. Next, shave as normal and also apply coconut oil once you finished shaving – this will help with added moisture. Coconut oil may help reduce razor burn and is also anti-bacterial and anti-fungal, so the chance of razor bumps coming may also be reduced! Hopefully this will help during the No-Shave November season – we promise that both you and the ladies will LOVE the softness of your new grown beard!